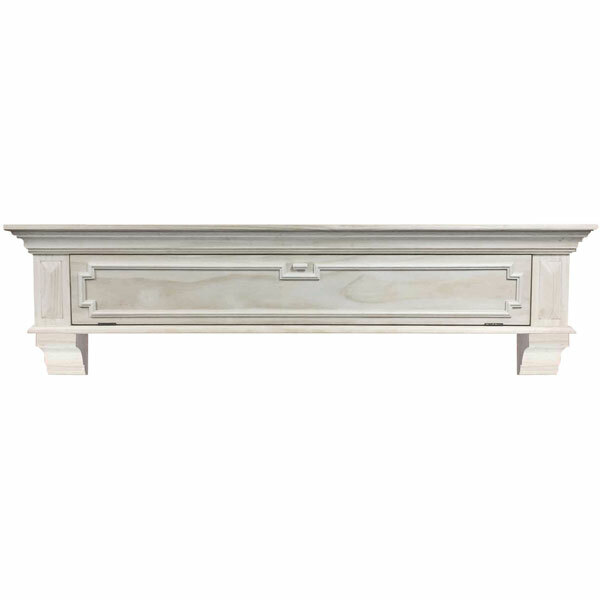 Get a stylish wall shelf combined with drop-front storage with the Pearls Mantel Thomas Drop Front Storage Shelf. This durable solid pine shelf arrives unfinished so you can paint it to your taste, or choose a pre-finished look. Hang it over your fireplace mantel or in any room to keep remotes, kitchen items, or even bathroom toiletries hidden from view and neatly in place. The drop-down front features a magnetic catch that opens to reveal a roomy felted storage area. Your choice of available length options. Shelf depth: 10 in.. Constructed of solid pine. Choose from available finishes. Distressed, transitional style. Features drop-down storage and hidden compartments.